Let’s investigate perfect squares and perfect cubes. The number 9 is a perfect square. 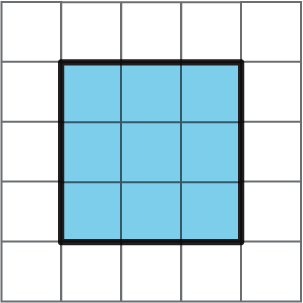 Find four numbers that are perfect squares and two numbers that are not perfect squares. A square has side length 7 km. What is its area? The area of a square is 64 sq cm. What is its side length? Use the 32 snap cubes in the applet’s hidden stack to build the largest single cube you can. Each small cube has side length of 1 unit. This applet has a total of 64 snap cubes. Build the largest single cube you can. What is the edge length of the new cube you built? 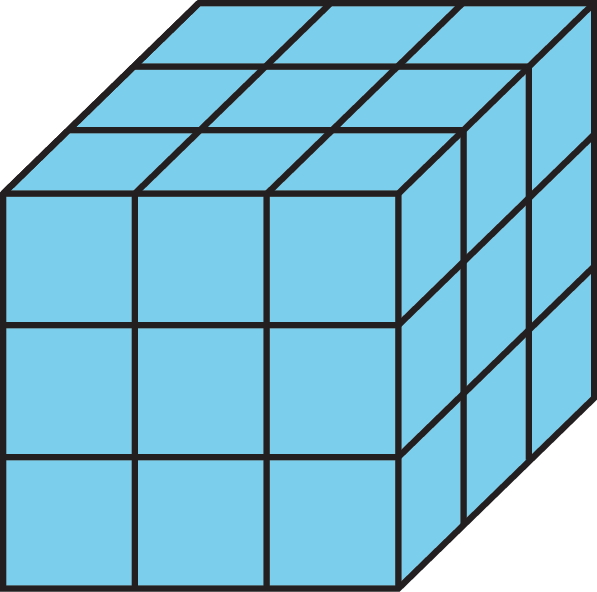 What is the area of each face of this built cube? Show your reasoning. What is the volume of this built cube? Show your reasoning. The number 27 is a perfect cube. Find four other numbers that are perfect cubes and two numbers that are not perfect cubes. A cube has side length 4 cm. What is its volume? A cube has side length 10 inches. What is its volume? A cube has side length $s$ units. What is its volume? Make sure to include correct units of measure as part of each answer. A square has side length 10 cm. Use an exponent to express its area. The area of a square is $7^2$ sq in. What is its side length? The area of a square is 81 m2. Use an exponent to express this area. A cube has edge length 5 in. Use an exponent to express its volume. The volume of a cube is $6^3$ cm3. What is its edge length? A cube has edge length $s$ units. Use an exponent to write an expression for its volume. We also use this notation for square and cubic units. A square with side length 5 inches has area 25 in2. A cube with edge length 4 cm has volume 64 cm3. To read 25 in2, we say “25 square inches,” just like before. The area of a square with side length 7 kilometers is $7^2$ km2. The volume of a cube with edge length 2 millimeters is $2^3$ mm3. In general, the area of a square with side length $s$ is $s^2$, and the volume of a cube with edge length $s$ is $s^3$. An expression with an exponent of 2 is sometimes called a square. The reason $s^2$ is called the square of $s$ is that a square whose edge has length $s$ has area $s^2$. An expression with an exponent of 3 is sometimes called a cube. The reason $s^3$ is called the cube of $s$ is that a cube whose edge has length $s$ has volume $s^3$. When we write an expression like $7^n$, we call $n$ the exponent.